Seems like forever, but my Body Mass Index (BMI) is now 24.6 (down from 26.1) which is just within the "normal weight" weight range. I guess to a certain extend, I have managed to reach my target of loosing weight through cycling, albeit the "fringe" benefits of bruises, cuts and sprained joints from the multiple crashes and mishaps. Throughout all this, my simple mountain bike has evolved to being a "trial mountain bike" wannabe... LOL. Changed to rigid fork with disc brake. Suppose to give me better control of the bike when learning pivoting or "rocking". Platform pedals for better balance and grip. Changed to longer handlebar for better handling and easier bike control. Changed to a aluminum brake lever (plastic brake lever will break) and adjusted it to allow one finger braking. Changed the rear rim to a wider Alexrim with a 2.35 Maxxis tyre. This in turn requires a new cassette and a new chain. So why this transformation? And what the heck is Bike Trials? "Bike trials is an individual sport that incorporates the use of a special bicycle which the rider must maneuver and balance on in order to complete specially designed artificial or natural "sections." The objective is to pass through the sections with as little physical contact with the ground as possible, hence obtaining minimum penalty points." So why this transformation? Well, since my last post on this, I have singled out Bike Trials as extremely interesting and challenging. It requires one to possess technical skills that enable us to have total control of the bike to navigate through tough, tight and almost impossible situations or terrains. And also very importantly, learning the skills of trials allow me to practice within my house yard rain or shine. Usually by the time I get home after picking my kids from tuitions it will be around 9pm. So I usually start practicing at about 10 something and be done by 11 something (before my neighbors start to complain about the constant brake squeaking... LOL). The search for the trial bike started in KL, then PJ, then extended to JB and the words from the local bike shops are that in Malaysia you will not be able to find one. First off, all the bike shops salesman kept getting confused with the word "trial". Apparently, to them "trial" equals "trail", so much so that I get tired of explaining what the differences are. But some of them I spoke to later did their own research on the net and came to realized that they have been missing out on a whole genre(?) of mountain biking.... LOL. So my search took me to New Zealand. Why there? Well, I thought that if I order the bike from there, my sister will be able to bring it back for me... in theory... :-) So I placed an order for two Satan bikes (as Sean, fellow trial enthusiast, also wanted one). It took forever for the shop to get back to me on the bike components. I guess things are VERY laid back down there. So we ditched the idea. While waiting for NZ to get back to me, I found out that Singapore is VERY big on trials! Trials has been part of the Singapore bike culture for years now (check out the Chaosinduction website). They have the World top 20 ranked riders. Really impressive!!! In the meantime, Sean was in contact with Armstrong of Armcycle, another trial bike shop owner and a trial bike veteran of Singapore. 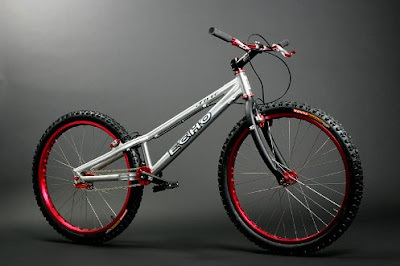 Sean has been eyeballing the Echo trial bikes for a long time now. Through the ZHI bike's website, he found out about Armcycle and one thing lead to another, we ended up ordering our Echo Pure 26" from Armstrong.